Humans are becoming progressively more wasteful. It used to be that items were used as long as they were usable, mended as needed, and then repurposed if possible. It is refreshing to see that slowly, this common-sense practice is once again gaining ground. There is so much truth to the adage: One man's trash, is another's treasure. Today, we look at some of the most creative uses of fabric scraps. First, a stunning piece from vidals, California based designer. 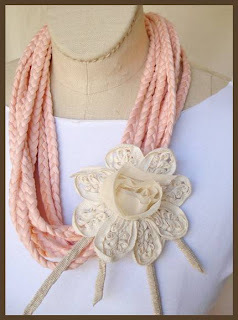 This multi-strand, braided textile necklace is created with recycled scraps of pinky peach jersey from factory left overs. She has finished it with ivory rope trim which complements the ivory flower that was salvaged from the trim of a blouse. 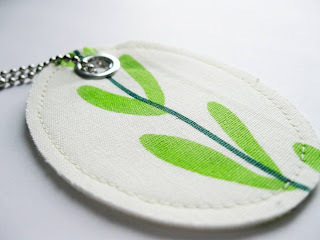 A very simple, yet sweet keychain was made by handbag designer, lynndavid. She calls these scraps "just too cute to toss out". I couldn't agree more. 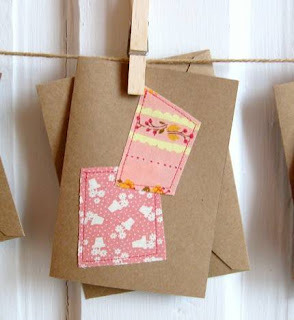 Pretty pastel fabric scraps add a fun splash to plain kraft paper cards. These lovely notes come courtesy of shopscrapyard. If you have scrap fabric, chances are you also have a stash of needles. Maybe you find yourself constantly wondering where you might have left them? Here's a solution to that problem. 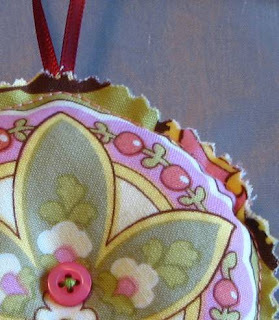 This "poppet" is a hanging pincushion. Find it in the shop of sanourra. If you wish to start your own scrap collection, maybe this bowl would be the perfect spot to start depositing your odds and ends. 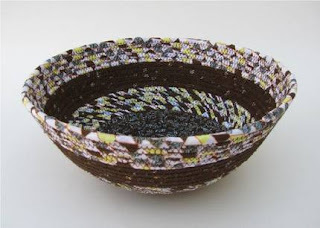 This bowl from CornerstoneLAE, is made up from four lengths of scrap quilting fabric. Once your scrap bowl is brimming with bits, I hope you have fun coming up with some fun ideas of your own of how to put your scrap to good use.